Ethereum continues to see a sell-off with little to no relief in sight. 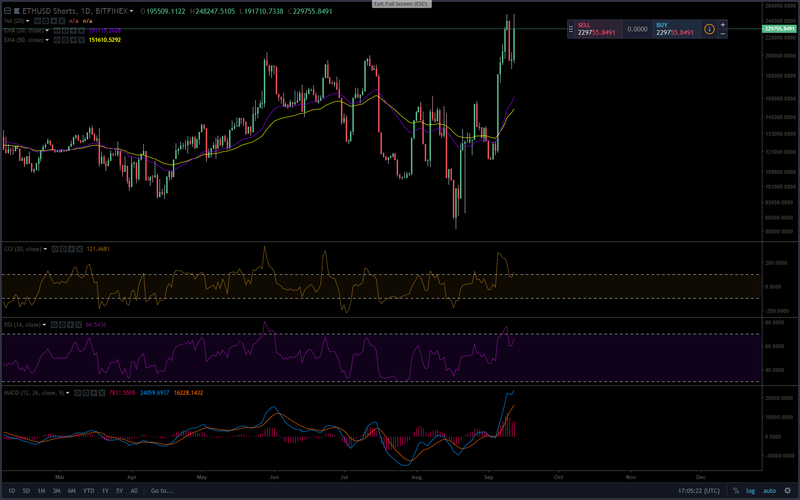 ETH/USD shorts reached a new ATH on Bitfinex of 248,247 surpassing last Friday's record of 247,611. Over the last four weeks Ether shorts have increased by 200%. Short positions reaching this high usually end in a "Short Squeeze," which is where the price begins to move up forcing short sellers to close their position and therefore putting upward pressure on the cryptocurrency. Extreme highs like these tend to show signs of bearish exhaustion, but we have not seen that yet with Ethereum. Though, taking any new short positions at this time is not recommended as the risk/reward ratio is far too high. Ultimately, the deciding factor for if the shorts will have to start closing their positions is going to be Bitcoin. If Bitcoin does manage to gain ground upward in price then it's quite likely that a short squeeze will happen on Ethereum. 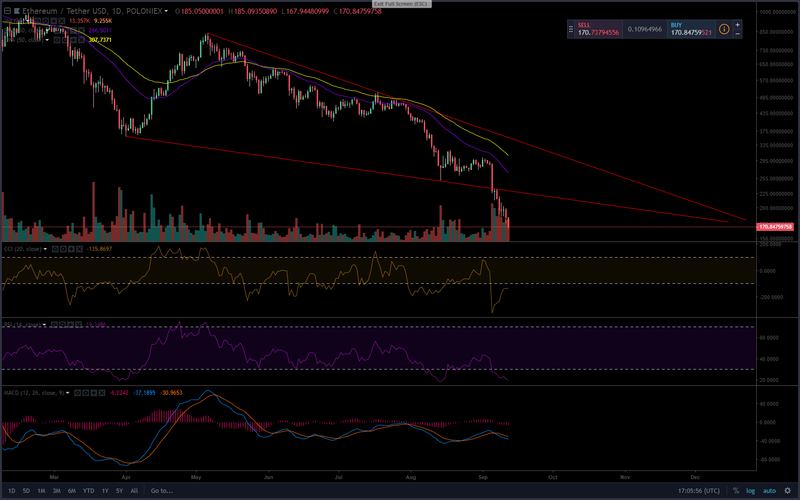 If we see Bitcoin fall back under $6000 the bearish posture and pressure is likely to continue forcing the price of Ethereum even lower. The chart below is the ETH/USD pair which is in a pretty much identical setup as the BTC pair. Both pairs are demonstrating they are in very oversold territory with shorts extremely high, but the pressure remains.